Game Design MA student Cole Wramplemeyer talks with other game professionals and enthusiasts at Indie Arcade. Indie Arcade, Coast to Coast, which began as a local showcase of independent games in 2014 has now grown to include developers from 17 states and 6 countries. 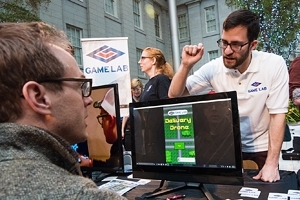 Held January 16 by the Smithsonian American Art Museum and American University Game Lab, the latest event featured the 2016 Independent Game selections and a selection of classic arcade machines for an audience of 11,755 visitors. Beyond simply showcasing fun games, this event seeks to give games their place among famous artworks by presenting them as both fun and expressive. Chris Totten, American University (AU) professor of game design, says, "Here in the Game Lab, two of our driving questions are: 'How do games fit into the context of art, media, and other cultural artifacts?' and 'How can game makers help leading cultural institutions address games?' Working with organizations like the Smithsonian, International Game Developers Association (IGDA), MAGFest, and others - all leaders in expanding the cultural impact of games - are vital for answering these questions." The event also affords creative independent game designers and developers the opportunity to show their work at a 1-day event open to the public. There is a focus on games with the potential for social and cultural impact and games unusual in their focus on narrative and innovation. In its first year 20 independent developers showed their work to an audience of more than 4,000 people. Totten explains, "Besides a beautiful space, the event has a unique advantage of being in an art museum where visitors savvy in viewing art can be confronted by the evolving games medium. This integrates games into the broader cultural discourse in ways that they cannot be in game-centric spaces." AU GameLab was a major presence this year; students and faculty answered questions and shared insights with professionals and game-lovers of all ages. Faculty work was on display, including Game Lab Director Lindsay Grace's game "Big Huggin'", a perennial crowd favorite. Future video game designers can check out game-building workshops, while sci-fi fans new and old will appreciate the chance to play two movie tie-ins from the early 1980s: "Tron" and "Star Wars." It is the biggest event of its type in the nation's capital. "For the AU Game Lab, we are glad to have been a leader in creating an event that is a source of both local pride and international resonance. We hope that other development communities and institutions see the success of Indie Arcade and are inspired to create more new opportunities for developers to have their work recognized," says Totten.